The Jets quest for the National Championship at the Keepmoat Stadium in Doncaster on September 21st 2008 against the London Blitz. The Cassidy Jets head into the British National Championship Game at this weekends Britbowl buoyed by the news that Andy Steadman is available whilst his ejection from the semi-final victory over Bristol is appealed. 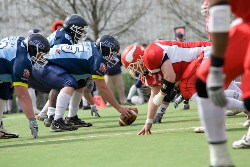 The NFL Europe trialist was sent from the field during the fourth quarter of Coventry's 31-28 win over the Aztecs after what was deemed a late blow. Cornerback Adam Biggs came through the match-up unscathed after having missed the majority of the season through injury. The Jets will need both Biggs and Ahmed Hashim to be on top form as they go up against the London Blitz, whose talented receiving core is led by Rod Bradley, aka 'Spartan' from Sky 1's Gladiators. The Jets are further aided by the news that James Hossack, whose 2 touchdown effort versus the Aztecs earned him a share of the BAFL Player of the Week award, has recovered from an injury scare that threatened his place at the final showdown versus the Blitz. Last season's title game saw the London Blitz crowned Champions for the first time as they came away with a narrow 13-6 victory. Both teams struggled to move the ball in that encounter and turned the ball over several times, Jets linebacker Jason Allen chipped in with 3 interceptions alone. This year should see a completely different ballgame. Dax Michelena has led Coventry's offense to become the highest scoring in the Premier, narrowly ahead of the Blitz’s third ranked unit. into the final with the tag of favourites. However, that game back in late May was played by the Blitz without the presence of both wideout Bradley and defensive leader Jason Brisbane. The inclusion of the star pair should have a weighty impact on the eagerly anticipated clash. Britbowl XXII is hosted at Doncaster’s Keepmoat Stadium on Sundat 21st September at 16:00. Entrance is £10 for adults with car parking available at the ground for £2.